The ways the Internet supports our everyday lives have become richer, more engaging, and more mobile. While this is great news for users, it has resulted in developers and businesses stretching the Internet to support use cases for which it was never designed. As a result, businesses are constantly challenged with the complex requirements needed to keep users engaged, satisfied, and loyal. Organizational complexity resulting from the tighter alignment and collaboration between marketing and IT departments. 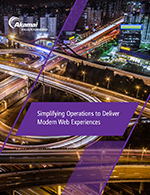 Architectural complexity that stems from balancing the need to deliver rich features, speed time to market, and manage cost efficiency in network infrastructure. Audience complexity driven by increased device fragmentation, a dispersed delivery landscape, and rising user performance and personalization expectations. The intelligent cloud tools that can be leveraged to overcome these areas of complexity and simplify web operations.